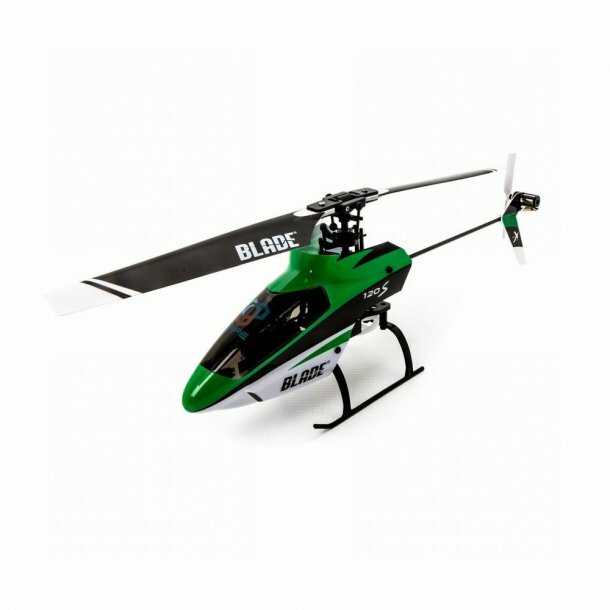 Blade 120S BNF mini helikopter til 2,4 GHz Spektrum DSM2. Modellen er beregnet til at flyve på 2,4 GHz Spektrum DSMX, og kan benyttes med alle sendere der overholder denne standard. Komplet sæt, mangler kun sender for at være flyveklar. Har indbygget elektronik som består af 2,4 GHz DSMX modtager med SAFE teknologi, 2 servoer, mikser, fartregulator og gyro. Batteri: 1 stk. LiPo 500mAh-1s. •Multifunction 6+ channel transmitter with Spektrum™ DSMX® 2.4GHz technology. •Beginner mode: Small pitch and roll angle limits combined with intuitive self-leveling help you keep the heli under control. •Intermediate mode: Pitch and roll limits are expanded to offer a larger flight envelope while intuitive self-leveling continues to provide positive stability. •Experienced mode: Limits and leveling are removed to provide full maneuverability. Larger than a micro-class machine, the sub-micro 120 S is great for outdoor flight in low wind, yet it's still small enough that it can be flown in a variety of indoor spaces. Plus, it's practical to have more batteries on hand since the 120 S uses a low-cost 1S Li-Po battery. The lightweight airframe features durable polymers and carbon-fiber components that deliver mechanical precision and the tolerance to absorb typical mishaps. The new flybarless head design offers a higher level of mechanical efficiency as well as a lower parts count which makes helicopter maintenance simpler. The two 2.9-gram linear long-throw cyclic servos deliver the ideal level of torque and speed for precision and stability that's remarkable for its class. The included charger operates from any convenient USB power source. Expect the provided 1S battery to offer average flight times of 5 minutes. The factory-installed 4-in-1 control unit features a Spektrum™ 2.4GHz DSMX®-compatible receiver, main and tail motor ESCs, mixer and flybarless controller. Count on the industry-leading reliability of Spektrum technology to deliver precision control that's ideal for any flying site environment.